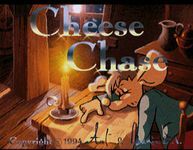 Play a mouse trying to get cheese in a maze. Avoid rats and bombs. Open and close doors to help yourself survive. The game is played from an overhead view that moves horizontally and vertically as you explore the screen.